Hi friends! Hope that you are doing well. I'm blah. What can you do? I have another doctor's appointment today, hoping it will bring some answers. My CT Scan came back normal with no kidney stones. Thanks for all the prayers and thoughts! Onto BETTER and HAPPIER things! Today is Shannon's (owner of Paper Made Bakery) birthday! YAY! HAPPY BIRTHDAY SHANNON!!! 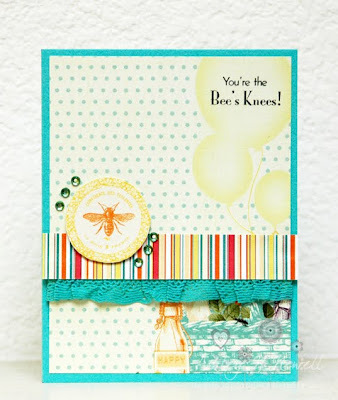 Of course I had to use my AWESOME Sunday Afternoon kit to make her card. Every single thing I used on this card is from the kit. Check out the Paper Made Bakery Blog to see what a couple of the other girls have made for Shannon. Have a great day, friends! I'm sorry you didn't get any answers from your CT-scan and hope your Dr. is able to help out a bit. I love this card, it's absolutely gorgeous!! That is such a pretty card!! Love it! YOU ARE AMAZING! I love love love this card--and the sentiment is not crooked! <3 LOVE!